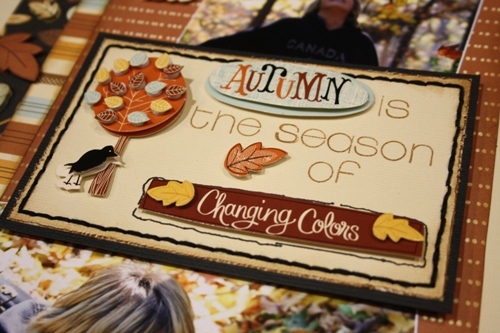 Have you ever scrapbooked photos for someone else? I haven't but I did for this layout. It is one-page sketch week at Sketch Support and I used photos of Spencer (Joanne's youngest son) on my layout. Here is the sketch. 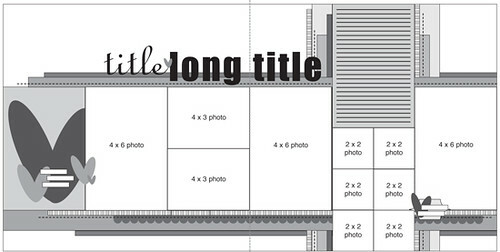 And here is my layout. Sorry about the blurry photo. It was taken on Friday night at about 11pm. 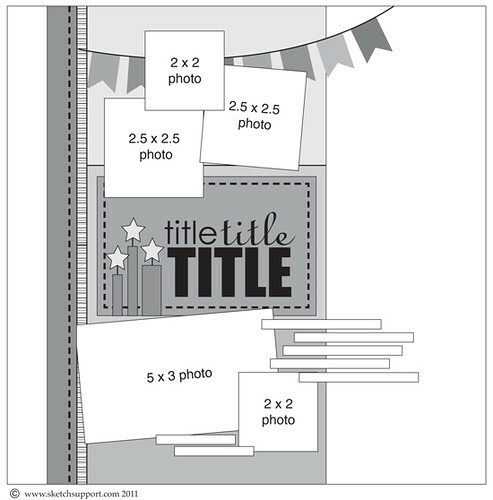 I created my title using a combination of of stickers and stamps. 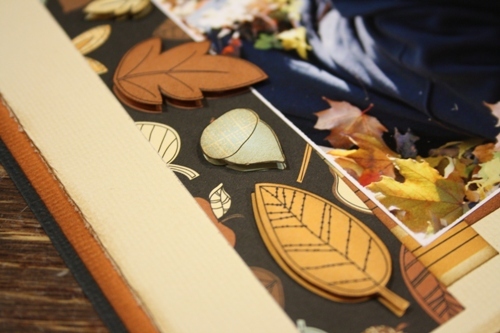 I hand cut some extra leaves and layered them on top of the pattern that was on the paper strip. I used a stamp and made a journal area. 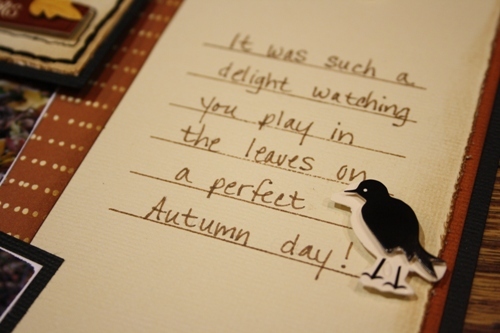 Joanne wrote the journaling using a brown marker. 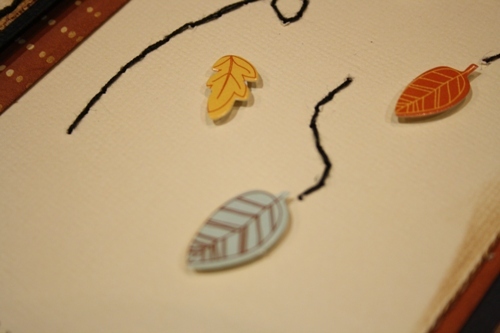 I popped up some of the leaf stickers and added some stitching. Stop over and visit the Sketch Support site and get a copy of this sketch for yourself. While you are there, check out what the rest of the team has been up to. Candy Corn Treat Cone Winner! CARLY! Congratulations!!!!! You can stop by the store anytime to pick up you prize. Halloween Treat Cone & Giveaway! I have been busy playing with another SVG file from SVG Cuts. I think I have a small addiction to these little cutting files. They just released a brand new Halloween set called Party on Elm Street and one of the files was this really cool treat cone. I couldn't wait to give it a try. 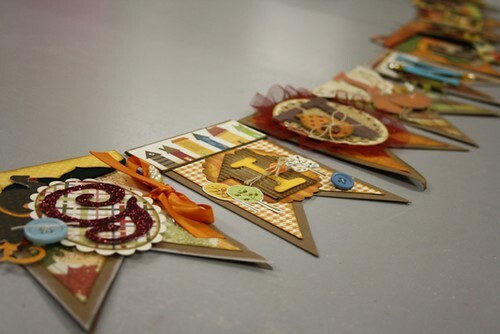 I created the base using black cardstock and then I added Bo Bunny double dot cardstock to make it look like candy corn. I filled it with shredded kraft paper and some mini chocolate bars. I used some black wire and attached it to each side so that I could hang it from a door knob. I embellished the outside with black tulle and an orange button. I also added a spider button and used a black marker to create the dashes. Now for the giveaway part! 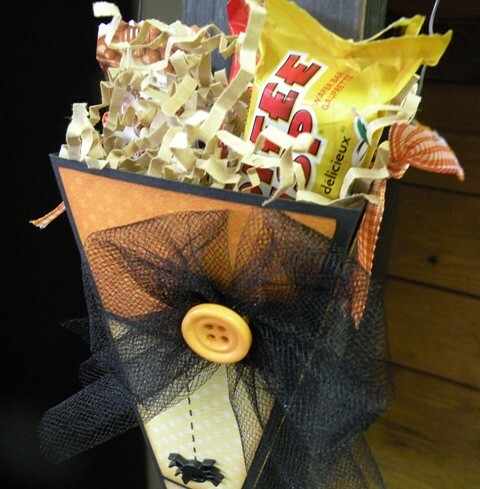 I thought it would be fun to give away one of these 'not so spooky' treat cones. To win, it's simple.......just leave a comment and I will do a random draw on Monday, October 24th. 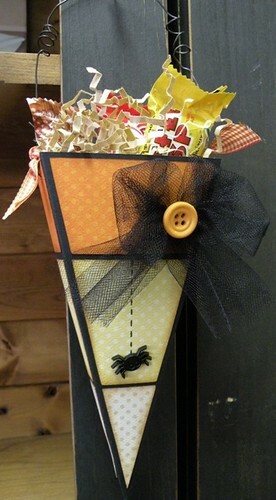 *winner must be able to pick up the treat cone at Two Scrapbook Friends by Monday, October 31st. It has been a busy week for me......I created 2 double-page layouts for this weeks sketch over at Sketch Support. For those of you that know me, that is a difficult task. 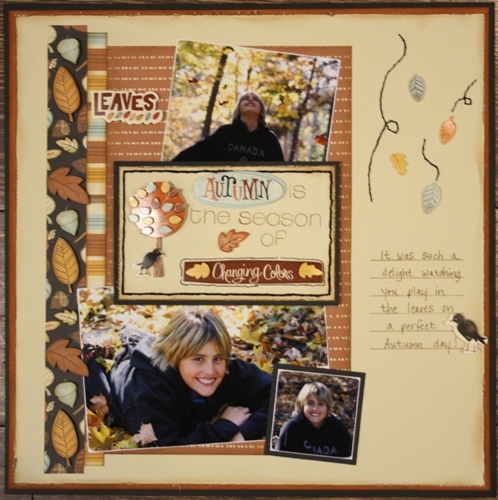 Today I am being featured for the Simple Stories product challenge. I used the sketch below to create my layout. And this is what I came up with. I don't scrapbook photos of myself very often (mainly because I am always behind the camera and don't have a lot of pictures). This is my 41st birthday. Joanne surprised me with a homemade lunch at the store and she took a bunch of photos of me opening my presents. I created a section on my page that has the month I was born. This piece was cut from the pattern paper and I added stickers and used pop dots to pop them up. I used stickers and stamps to do the journaling on my layout. The title is also created using stickers. This collection is so much fun to play with. 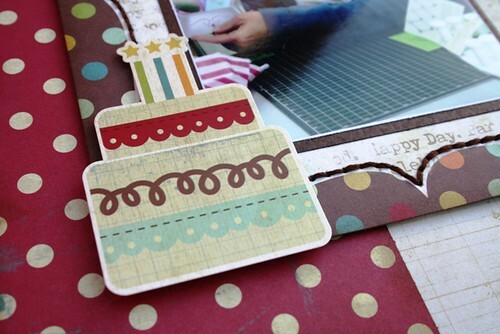 I added a birthday cake sticker and a little stitching around the frame of the main photo. If you haven't had a chance to play with this collection yet, I highly recommend it. 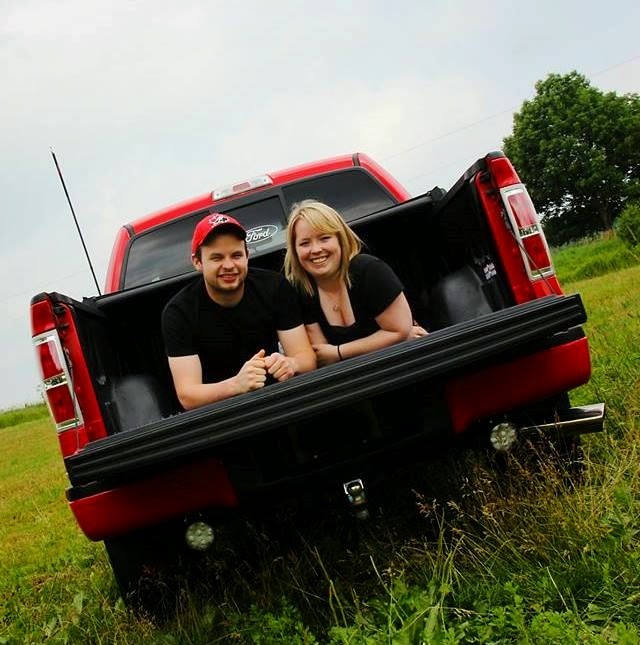 On Thanksgiving weekend we had some family photos taken and I have finally got a sneak peek! 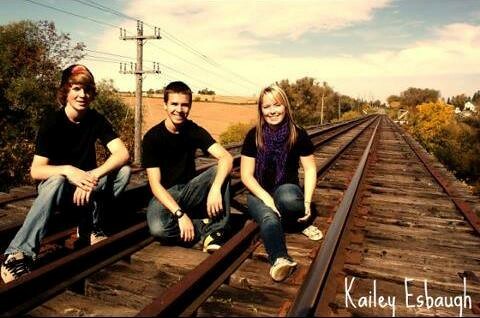 These are the only 3 that I have seen and I think Kailey (the photographer) took around 300 pictures. I can't wait to see them all! 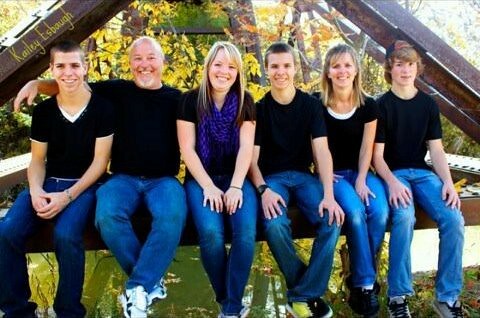 Here is the whole family (starting on the left): David (he is my son's best friend and my 'adopted' son), Monty, Amanda, Jay, Me and Matt! I just love, love this shot! My kids are looking so grown up. I am so proud of them. 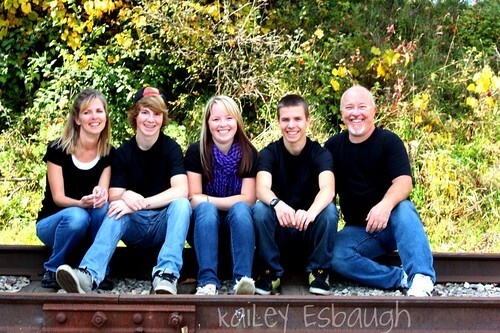 And here we are as a family again. Although we are all smiling, we were terribly hot! 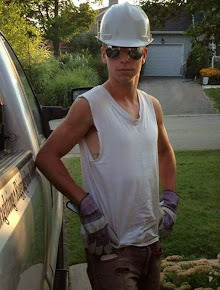 The jeans and black shirts look good, but not so nice on a hot, sunny day! Today I am being featured on Sketch Support. It is October's 2-page sketch week. If you visit the website you can download a copy of the sketch and print it off for yourself. Here is the sketch they are offering. I decided to create a layout using the new Bella Blvd sports collection. Usually the only sports photos I have are for hockey (not complaining). 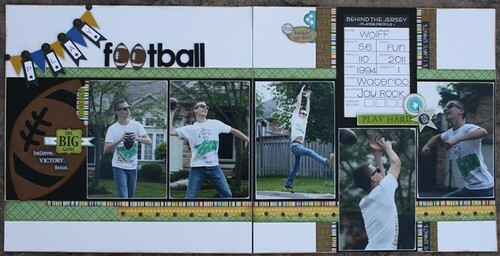 I pulled out these photos of Jay tossing around a football. 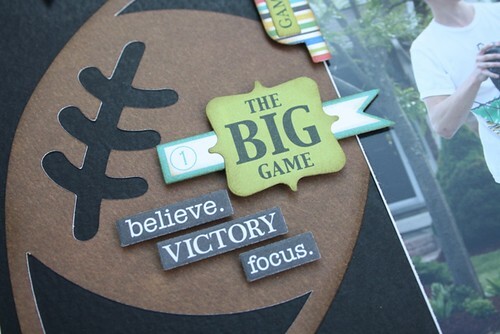 I found this SVG cutting file of a football and enlarged it to fit my page. 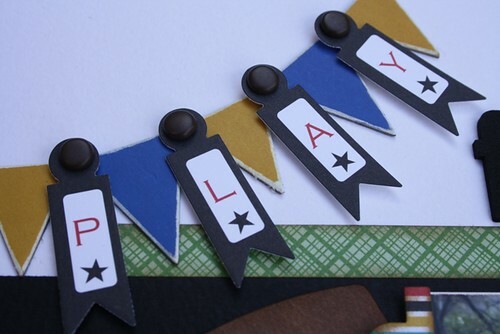 I layered chipboard banner pieces with the tag stickers to create the first part of my title. 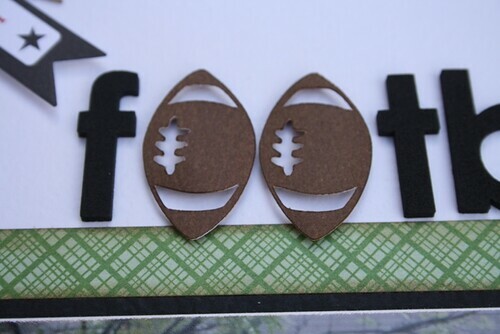 Then, I cut out a couple smaller footballs and used them as the o's in the rest of my title. 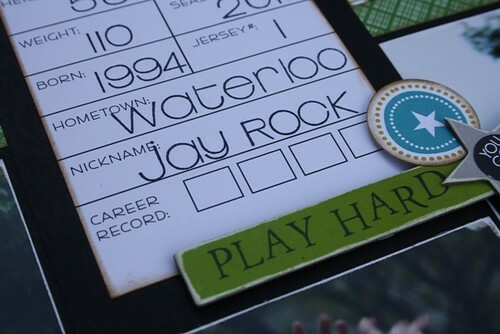 I included a journaling die-cut that was like a stat sheet. I filled in all Jay's current statistics (which will be fun to look back at when he is much older). I don't think being a football star is in his future but it was fun to do a page on something other than hockey. 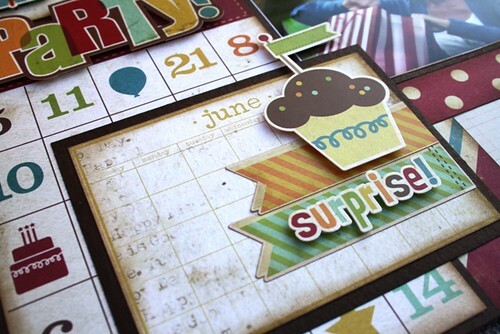 I have been totally inspired by Avril from the Two Scrapbook Friends design team. She is always creating amazing 3D projects. I have been wanting to give this a try for quite some time, but something always got in the way. I finally tried to make something and I am totally hooked. 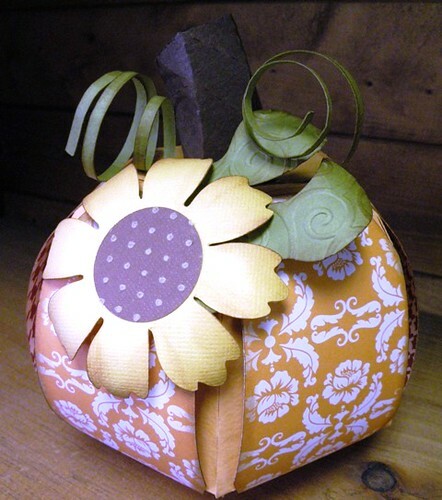 I found an SVG cutting file and made this 3D paper pumpkin. I had so much fun putting this together. 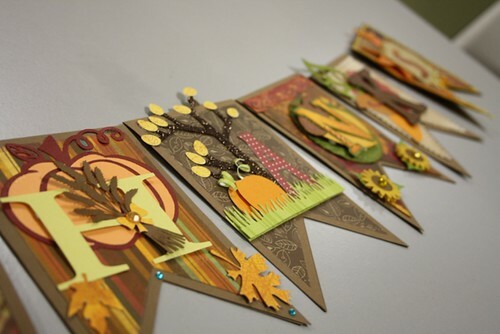 Each piece is cut out separately and then you have to assemble it. I was very intimidated at first but once I got going on it, it wasn't so bad at all. I am working on my second project and you will be seeing it soon! 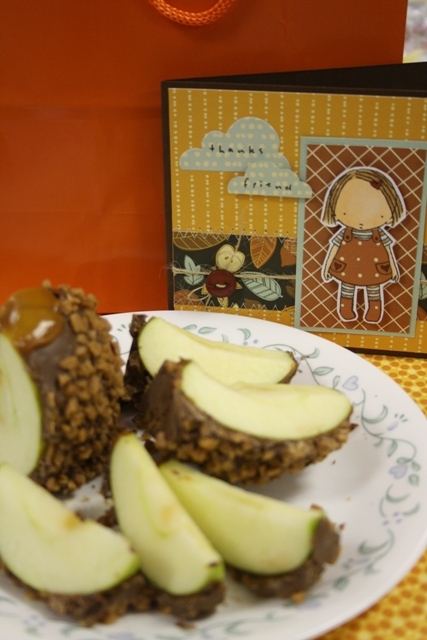 On Wednesday I was surprised by my best friend with a very special card and a delicious treat. 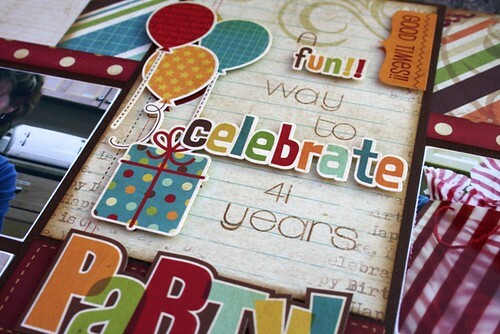 I had already admired this amazing card on her blog only to find out that it was for me. 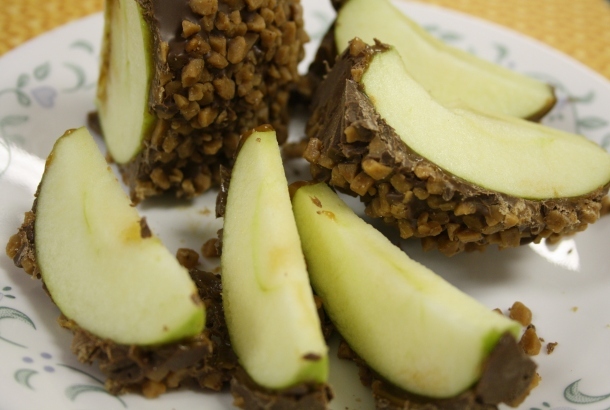 It was paired up with this delicious caramel/chocolate apple from the Rockey Mountain Chocolate Factory! There was no way that I could possibly eat it all myself, so I cut it up and shared it with her (and my mom). Thank you Joanne! It was a lovely surprise (but totally not necessary). I hope you have a great weekend. Sketch Support is hosting their monthly card sketch week. 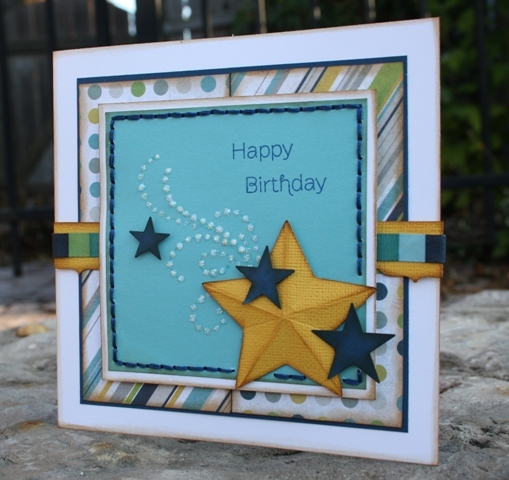 National Cardmaking Day just passed so I thought I would make a card. 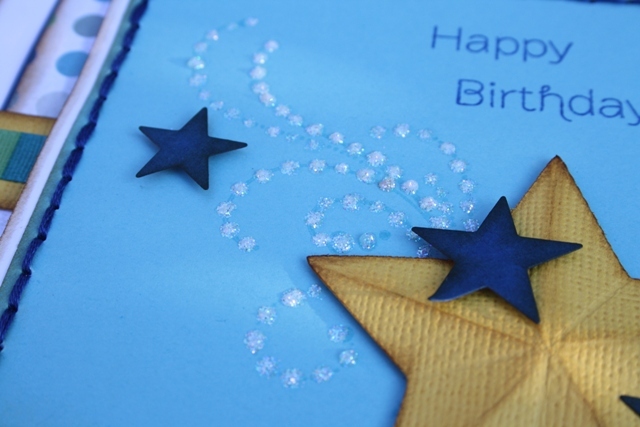 It was also Matt's 15th birthday on Thursday and I needed a card for him. Here is the sketch that we were given. 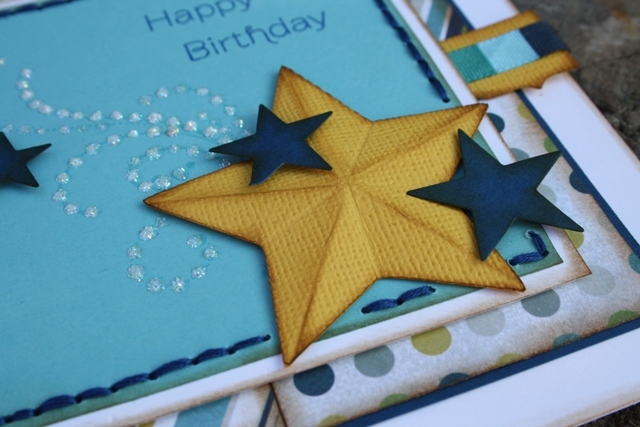 Sharon from the Two Scrapbook Friends design team did a tutorial on how to make these awesome 3D stars and I have been dying to give it a try. I am not a big flourish person but I do like to make my own once in a while. 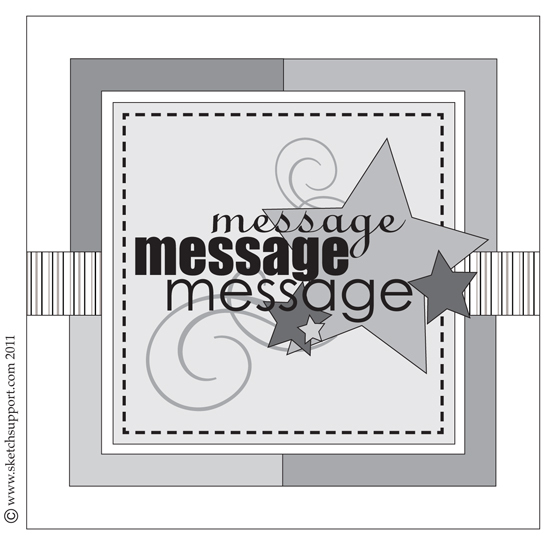 I stamped a flourish design with VersaMark and then added the Stickles dots. Pop over to Sketch Support and see what the rest of the Creative Team has been up to. Last Wednesday night I got together with the banner swap ladies and we exchanged our banners. 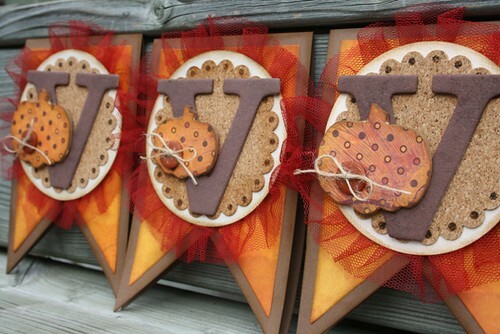 I did a sneak peek of my letter 'V' and here is the full view. 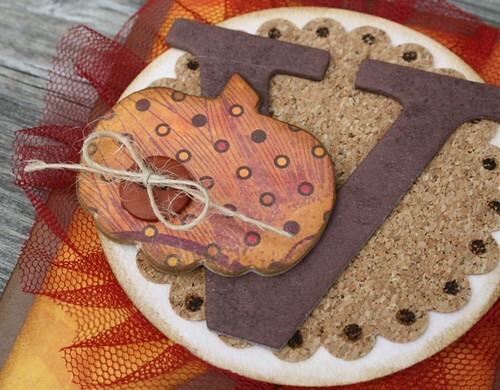 I used cork in my Cuttlebug with a Nestability for the scalloped circle and I covered chipboard pumpkins with paper. 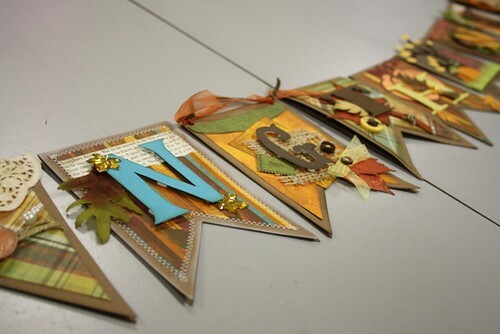 Here are some shots of the other banner pieces. And here is an image of the whole banner together. I will post a photo when I get it all put together and hanging in my house.